Other than the restaurant the Estate offer the possibility to stay either in charming rooms in a rustic style or apartments providing comfortable accommodation for up to 24 people. WE ACCEPT PAYMENTS WITH CREDIT CARDS. 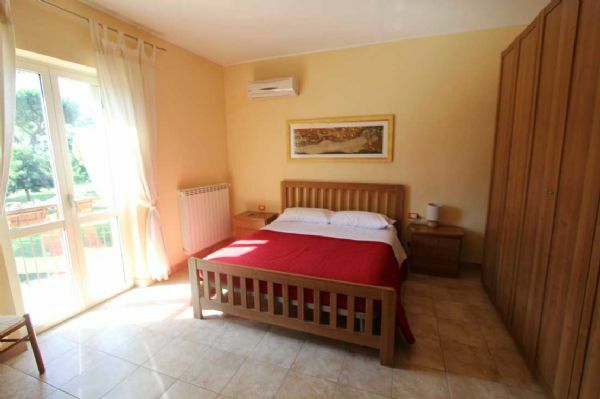 The rooms are made up of a double bed and an extra third bed, as well as a separate private bathroom. At guests’ disposal, air conditioning and breakfast available. The two apartments are, one on the upper floor, consisting of a master bedroom, a bathroom with hydromassage shower and a living room with kitchenette, fireplace, a great LCD TV and a sofa bed for 2 persons; the other is on the lower floor of the farmhouse, it has about 50 Sqm which allows a large double bedroom with a third bed, a bathroom, a kitchen and a small comfortable living room with fireplace. Stays start at 15:00 on the day of arrival and end at 11:00 on the day of departure, unless otherwise agreed. Upon arrival, each guest is kindly requested to provide the Reception with an identity card to complete the registration formalities.